The Atlas V rocket set to launch NASA's Mars Science Laboratory (MSL) mission is illuminated inside the Vertical Integration Facility at Space Launch Complex 41, where employees have gathered to hoist the spacecraft's multi-mission radioisotope thermoelectric generator (MMRTG). The Flight Readiness Review for the Mars Science Laboratory was conducted Friday in the mission briefing room at NASA's Kennedy Space Center. At its conclusion, there were no issues that would preclude a rollout to the launch pad of the United Launch Alliance Atlas V rocket on Nov. 23. First motion from the Vertical Integration Facility is planned for 10 a.m.
At Space Launch Complex 41, the multi-mission radioisotope thermoelectric generator (MMRTG) was installed on the Curiosity rover within the Atlas fairing on Nov. 17. On launch day, Nov. 25, the countdown will begin at 3:25 a.m. 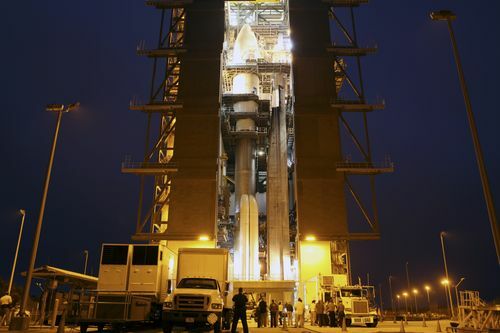 The process for cryogenic fueling, the loading of liquid oxygen and liquid hydrogen aboard the Atlas V, will begin at 8:15 a.m. (T-2 hours and counting).